For some reason best known to a psychologist (probably), at the beginning of this trip I had a hankering for French gastronomic speciality called andouillette. Every time we went shopping, I scanned the shelves and boucheries [butchers] for this particular delicacy but found none. On market day in Bram (Wednesday), I did spot a larger cousin of andouillette, andouille, lurking on the counter but thought it was too big so decided against it. Finally, in the Bram Carrefour, I found a pack of three [insert own joke here] andouilletes on the shelves and snuck them into our chariot [shopping cart], much to Francine’s disgust. 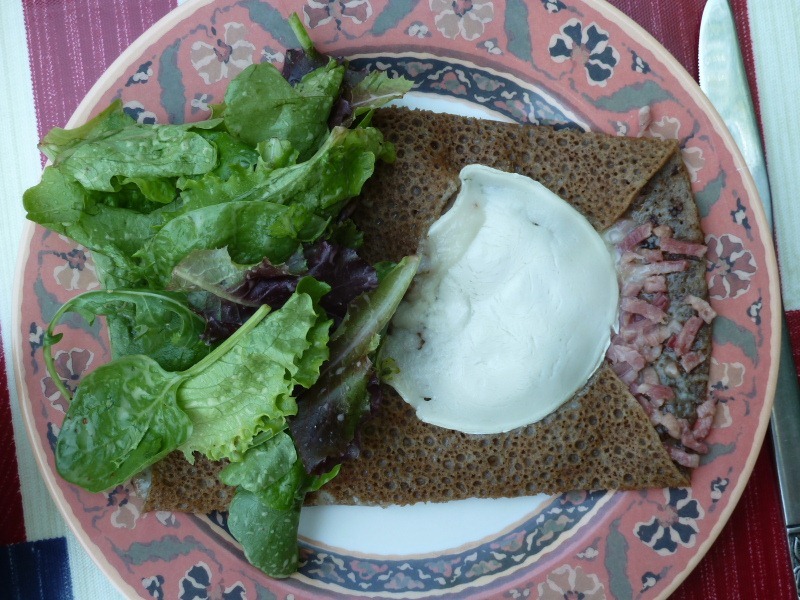 Andouillette and andouille are sausages made of chopped up chitterlings – the small intestines of pigs. Since a proper sausage skin is actually made from pigs guts of some form, these sausages amount to pigs guts inside pigs guts. Yum! For lunch, I was intent on stuffing one of my pack of three inside my own guts, which must result in guts cubed. 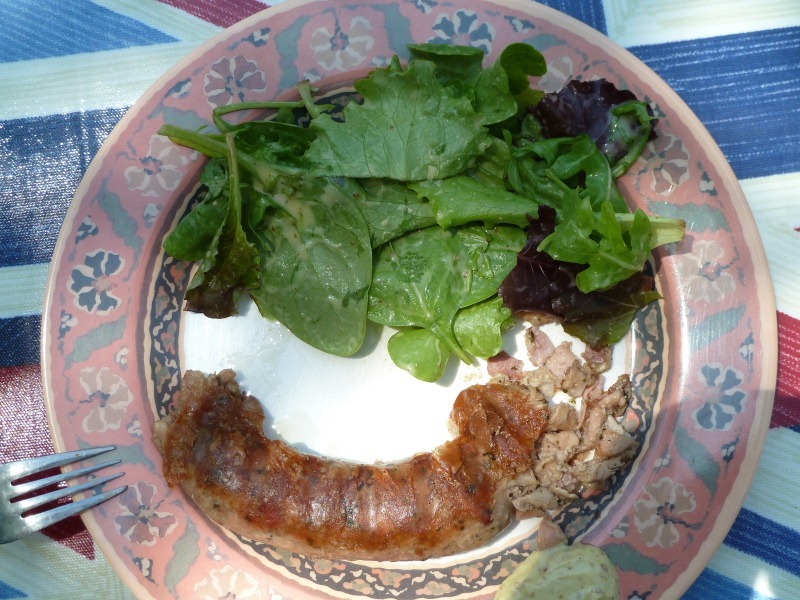 This picture shows my long sought after andouillette beginning to spill its guts after a darn good grilling. Having introduced these as French delicacies, I should point out that the name andouille is actually also used in the Cajun cooking of Louisiana, USA. I have a cookbook by Paul Prudhomme, a well-known exponent of Cajun cuisine, which mentions andouille. However, I believe the American andouille is a pretty conventional pork sausage. I assume that this is because offal, or variety meats as I think offal is known Stateside, is about as popular to most Americans as a bacon sandwich would be at a bar mitzvah.